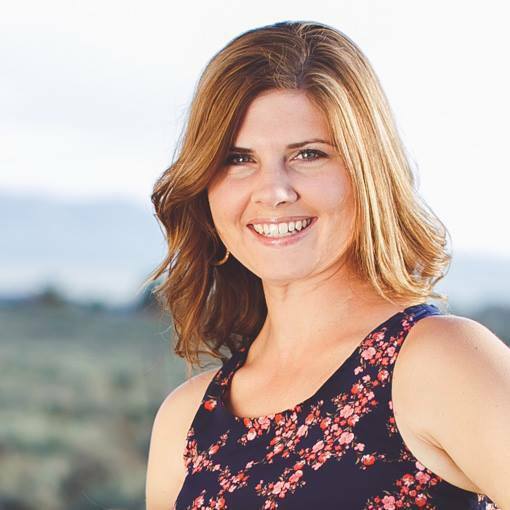 Finding grace, in the midst of my mess. There are seasons. There are days, weeks, and sometimes months, where you feel a constant prickly tension. There are times when you wonder why you can’t seem to get on the same page. There are moments, when you voice aloud your distaste for being at odds with one another, and there are stolen moments in quiet, when you let the tears fall with no one to see. Literally. Don’t stop caring enough to fight. Fight fairly, though. Don’t lose sight of what a God-honoring marriage looks like. No two people, if they are being open and honest, agree 100% of the time. You see, a God-honoring marriage is not one that is void of disagreement. On the contrary, it may be filled with it at times, but it will come down to the position of our hearts. Are our hearts aligned with His? Are we willing to humbly accept when we are wrong? Are we willing to extend grace, despite our circumstance? Are we willing to listen, when we are bubbling over with words? Are we willing to fight fairly? Again, are our hearts aligned with His? Keep fighting for your marriage, but please fight fairly. And, look for the light. Because, friends, there are other, much longer, and better seasons. There are days, weeks, and often months and years, where the relationship is sweet. 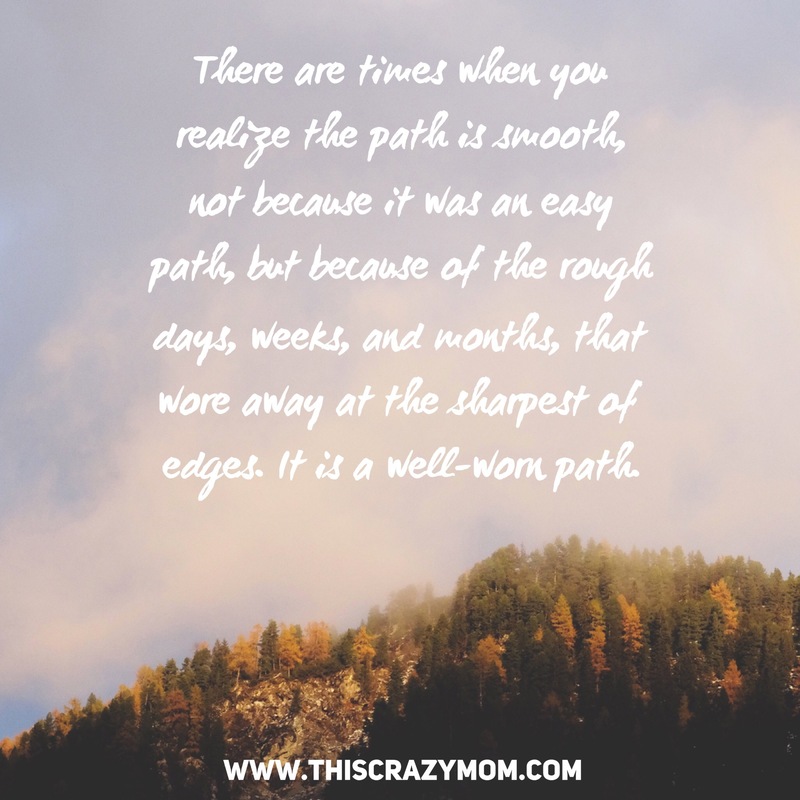 There are times when you realize that the path is smooth, not because it has been an easy path, but because of the rough days, weeks, and months, that wore away at the sharpest of edges. It is a well-worn path. There are moments, when you feel so strongly, there are no words to speak, and even in the quietest moments, the tears fall from such overwhelming joy. Marriage is a beautiful, messy climb, full of crags. It’s craggy business. Craggy. I like it. One definition is “rough in a way that suggests strength”. Keep climbing. Keep fighting. Climb well, and fight fairly. Look for the light, because traversing one crag at a time keeps us moving upward, and the summit is just ahead. When you get there, be sure to turn around and check out the incredible view. Then, hand in hand, you can say, “Look what we climbed. Together.” Then, turn back around, because a new journey awaits. You’ll be stronger, ready to face new adventures. Together. Keep fighting, friends. *PLEASE NOTE that if there is verbal, physical, mental, or spiritual abuse in your marriage, it is not my recommendation to continue in that toxic or harmful environment. If this is you, please confide in someone you trust, or call The National Domestic Violence hotline at 1-800-799-7233. 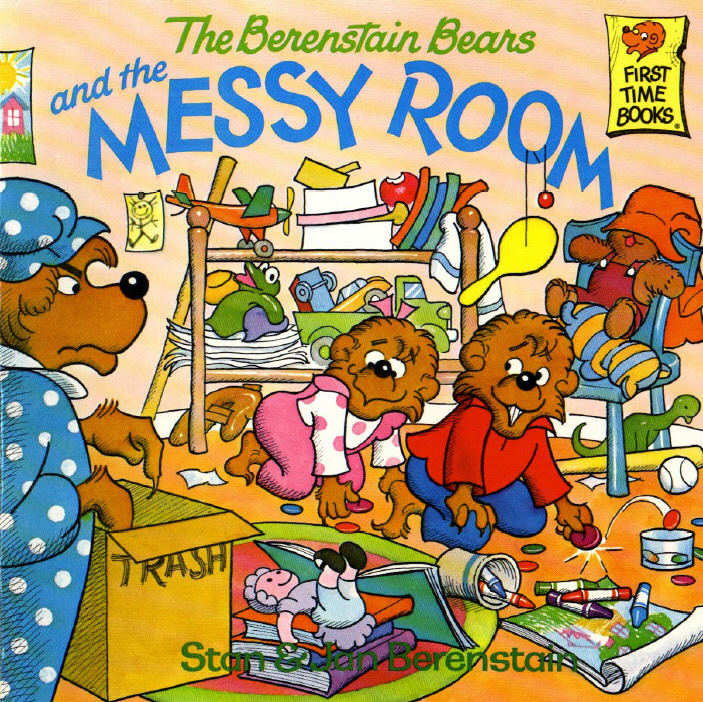 A few weeks ago, my kids rooms looked something like this a toy war zone. It also sounded like it from time to time…well, who am I kidding? It sounded like it much of the time! Apparently a plethora of toys does not equal compliant, kind, and joyful children. Who knew? There are children starving, literally to death, in other parts of the world, and what are we doing in America? Oh, that’s right, trying to keep up with the Jones’ and dragging our kids along with us. Stuff, stuff, and MORE stuff. Really…? 1) They did not appreciate a single thing. Why appreciate one thing, when you have ten more to replace it? 2) They did not get along. Too many toys = much chaos. You might think that many toys eliminates arguing because there are so many choices, right? Wrong. There is no sense of giving and sharing. There is, however, a sense of entitlement and stinginess. 3) When asked to clean their rooms, they looked at me like I had just asked them to climb Mt. Everest in flip flops and with a broken leg. Let’s be real, here. When I looked at their room, it overwhelmed ME. Imagine how it looked to a 4 year old! We kept what actually got played with; Legos & blocks. Baby doll & accessories. Books. Hot wheels. Baby toys. Dress up items. One or two other items that are actually used and added as recently as Christmas. Compared to the previous stash, it was a significant decrease. Regrets so far? Not a single one. At least, now, if they get out every single toy in their rooms, the clean up is still minimal and not overwhelming to them or me. I certainly do not miss all of the little toys that were, essentially, fill toys! They had no purpose, except to fill spaces! Everything has its place and it is amazing. Not only is it easier on me and them, but I believe that by reducing some distractions and excess, we are more able to teach and train our children in Christ. This is our ultimate goal for our children. We want them to love the Lord and seek to serve Him with their lives. Serving themselves is fruitless and selfish. The same for us, as parents and as Christians! Excess can be harmful to our walk. I’m not saying that having anything for ourselves is terribly awful, but our culture teaches us to keep piling food on our plates, simply because it is there. It is an ‘all about ourselves‘ culture. We are nowhere where we want to be as a family, and as individuals, but this was a start in simplifying some things in our home. Simple is good. Simple allows room for God to work. It is a journey and we should be constantly being propelled forward. This is just one area where we are being propelled as a family. It is not about just bettering ourselves, but it is more about freeing ourselves up for the Lord’s work. Will you join us in simplifying? Would you share with me about your journey? I would love to know how the Lord is working in your lives as well! I can’t fold fitted sheets to save my life. Yes, its true. I’ve seen my Memaw’s fitted sheets and they look pretty when folded. Mine? Not so much. Ok, well I may have just given up on making them even look remotely “pretty”. Oops. Did I just post this for all of the world to see? Yes. I did. I’m blushing now. I’m sure I’ll get over it. I did want to make a point though(see, and you just thought I was being silly!). You see, we all know that person, that mom, that woman in our life that seems perfect. In fact, she is likely pretty, organized, great at everything, seems to have it all together, and yes, probably folds her sheets nice and neat. So then we think that perhaps we need to put off such a vibe. So we fake it. We act like we have it ALL together and we don’t let anyone in. Especially, not in our closets where the messy, rolled up sheets stay. Because if we did? Someone might see that we, in fact, don’t have it all together, that we make mistakes, we cry, and no we don’t have perfectly folded sheets. What if I told you that “that” woman you idolize, yes HER, well she probably doesn’t have it all together either. Okay, well maybe her sheets are folded nice and neat…but she could fail in a different area than us, and maybe she is just as good at hiding it as we are. You see, we are all broken in some way, shape or form. It is innate and we are born with brokenness. This is why we need one another. This is why we need Christ. We need one another to encourage, strengthen and build each other up – that’s fellowship. We need Christ to take our brokenness and mend it. We can’t do this on our own. More importantly, we cannot be mended until we admit our brokenness. This goes for fellowship here on earth, as well as our relationship with God. You see, when we are real with our friends, they can begin to pray for us, encourage us and build us up according to our need. When we confess our brokenness to God, it is then, and ONLY then that the blood of Christ can take over. That’s right. We can’t be real and prideful at the same time. So along with being real, we must be humble. We have to recognize that Christ is what we NEED. We will always be messy and broken because that is our nature. However, when we have Christ, we have healing that is ongoing and within reach, no matter how badly messed up we may be.We just have to let him in. Yes, even into that scary, messy closet that you’ve been hiding for so long. Oh, yeah, you can’t just shut the door and move on. We have to let him look, assess and clean up. Oh, it won’t be pleasant, don’t get me wrong, but it will be worth it. 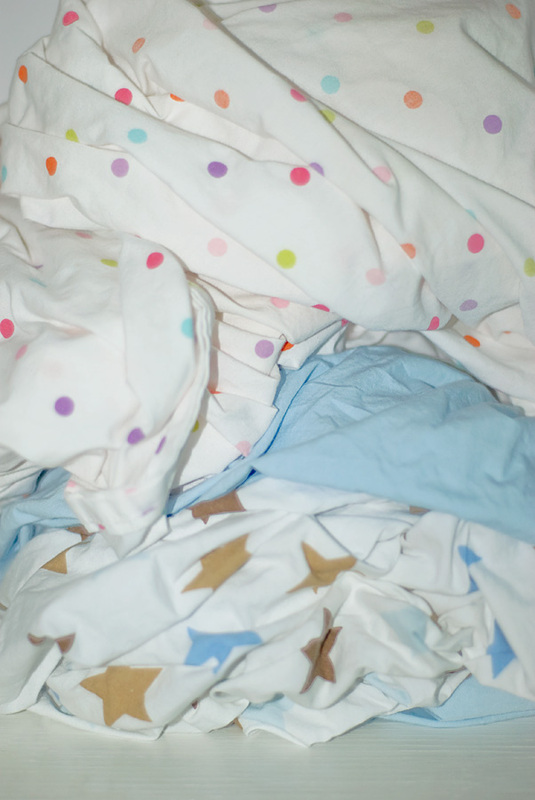 CLICK HERE to learn how to fold a fitted sheet.